Ideal relationship : I want to find men who will be oldest that me. I want that my man will be very experienced in life, and he knew how to make his woman happy. I would like to have a happy and strong family with husband and children and a dog, in our own house with a beautiful pergola in the garden, where we will gather in the evening for a family dinner. Myself after ten years I see as beloved wife, a good mother and successful business lady. More about me : I am very energetic and positive person. I have a good prevails, optimistic mood. I love an active lifestyle, travel, sport, nature, animals, flowers, romance and surprises. My hobbi- the horses and equestrian sports, I enjoy it since childhood. I go to ride in the country club where I worked as a groom coach. I also teach riding my son. Free time and weekends mostly spend with my family and son. We love outdoor recreation with barbecue and fishing, if the weather permits. My family is a priority, I think that this is the most important thing. I like to attend cultural and entertainment events. I believe that life should be bright and interesting and colorful , and I try to make it so for myself and my family. I like to spend time interesting and useful. I believe that in man, everything should be in harmony, so to develop themselves both physically and spiritually. My dream is to travel a lot and see a lot of interesting places and countries as possible. 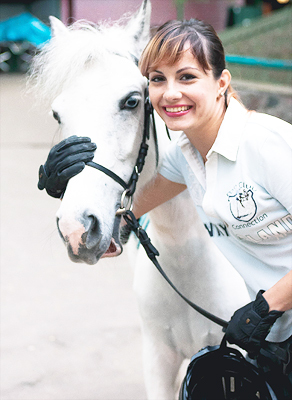 I am engaged in equestrian sports, fitness,I like dancing, skating, playing volleyball and other outdoor games. I visit art exhibitions, architectural expositions and festivals. I love theater and movie premieres interesting films. In film and literature I like science fiction, historical novel based on real events and romantic comedies.